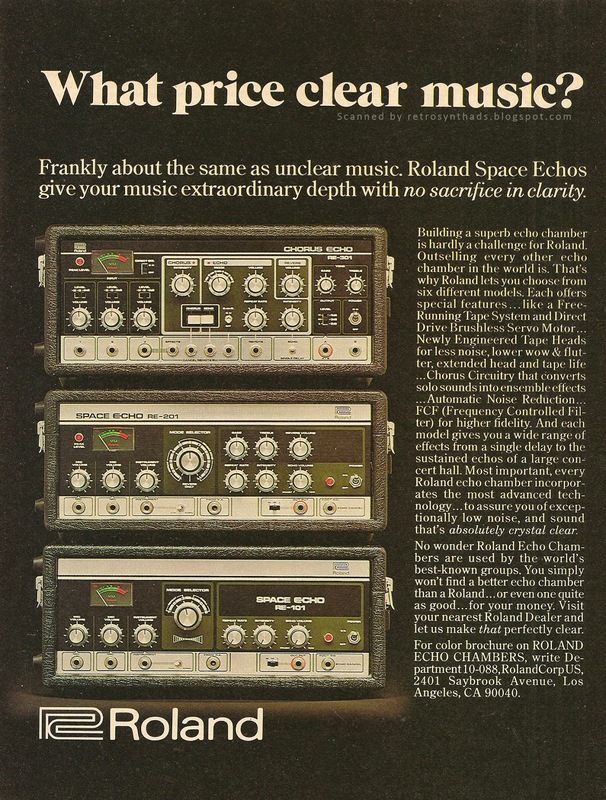 Roland Space Echos RE-101/RE-201 and Chorus Echo RE-301 "What price clear music" full page colour advertisement from page 47 in the May 1978 issue of Contemporary Keyboard Magazine. Man, is it just me, or does that black/olive green combo with pops of red look great. Wow, I love that. 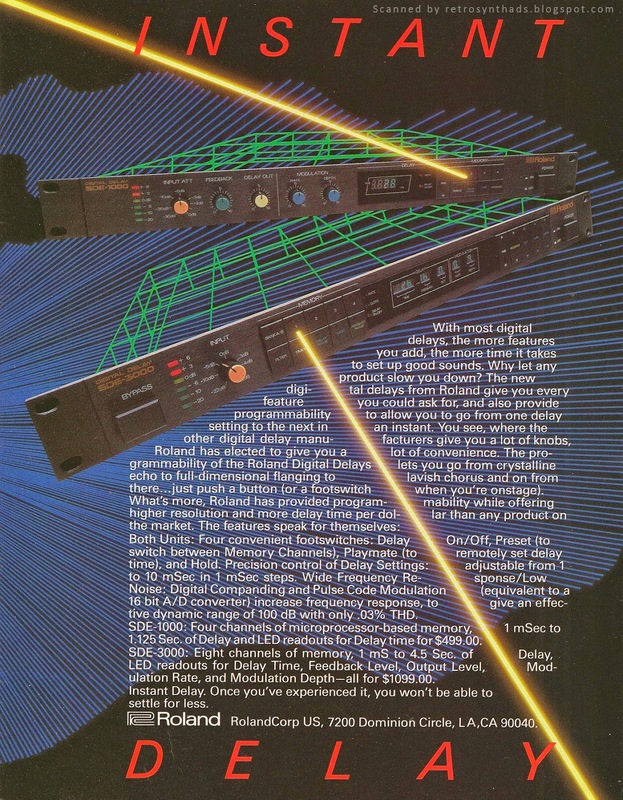 Anyways, in my recent blog post on Roland's 1984 advertisement for their SDE-series of digital delay rack effects, one of the major talking points about the design of the ad was that of readability. More specifically, Roland's design decision to consciously or unconciously put form before function and make the ad-copy fit within the design of the ad, even thought this would affect readability. In other words, the ad-copy became one big block of text. I also pointed out that Roland had done this with other ads as well, such as the one for their 1986 Alpha-Juno ad. "Get to the point, Retro!" Well, my point is that Roland was doing this waaaay before those two ads were created - and you can see it in this 1978 Roland Space Echo advertisement as well. Even more interesting is the size of the logo in the various ads. In those later ads, the logo is almost as small as the ad text. Still, it's interesting that if I asked you to look for the logo, your eyes would only take a few seconds to find it. Placement is everything. According to the RE-201 Wikipedia page, The RE-100 was the earliest in the series appearing around 1973 along with the RE-200, the main difference being that the 200 also included a spring reverb. Both were later replaced by the 101 and 201, and according to Sound on Sound's excellent November 2004 article on the history of Roland, these launched in 1974. That SOS article also dates the RE-301 as launching in 1977 and Part 2 of the article that ran a month later dates the RE-150 as coming out in 1979. The Wikipedia page also references a later RE-501/SRE-555 rack, and SOS dates it's launch in 1980. But wait... this ad came out in May 1978. And it mentions six models. But by 1978 only five models were released. Hmmm... So, either Roland jumped the gun on promoting the unreleased RE-150, Sound on Sound has some dates wrong, or... maybe I researched/typed something wrong. But, I can't find out where I may have gone wrong. Another possibility is that Roland is including the DC-50 digital chorus that came out in 1976. It had a similar look to the RE-series - big knobs, black/green colour, etc... Later DC-models like the DC-10 (1977) and DC20/30 (1978) were much smaller units with little design similarities with the RE-series. 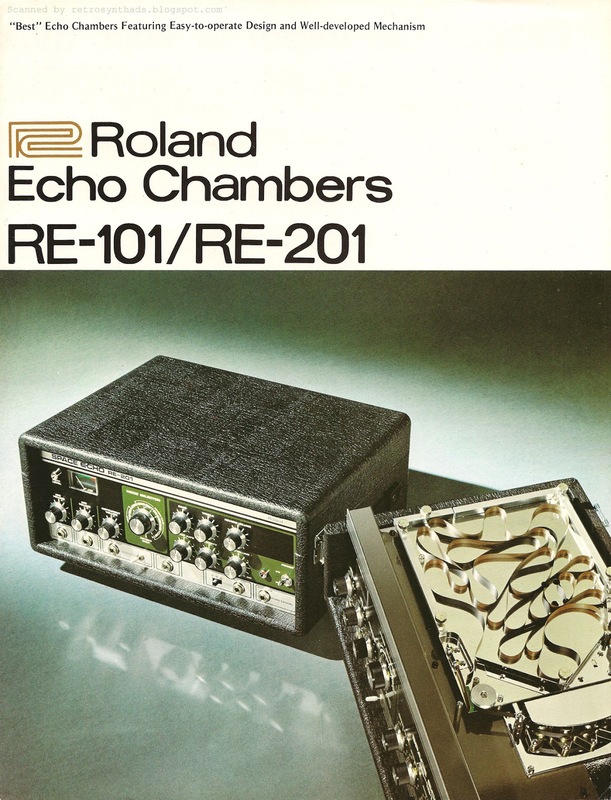 A really great comparison between the RE-101 and RE-201 can be found in a 1975 "Deepen the depth of your music" Roland Space Echo brochure I posted back in late 2012. One of the neat-o things about this early Space Echo brochure is that nowhere in the actual text of the brochure are either unit actually referred to as "Space Echos". Yeah, the name is on the actual pieces of equipment, but it's like Roland hadn't realized what an awesome name "Space Echo" was back in 1975. As you can see by this ad though, buy 1978 Roland had figured it out. And the "Space Echo" name had become a more general term, even for the "Chorus Echo". 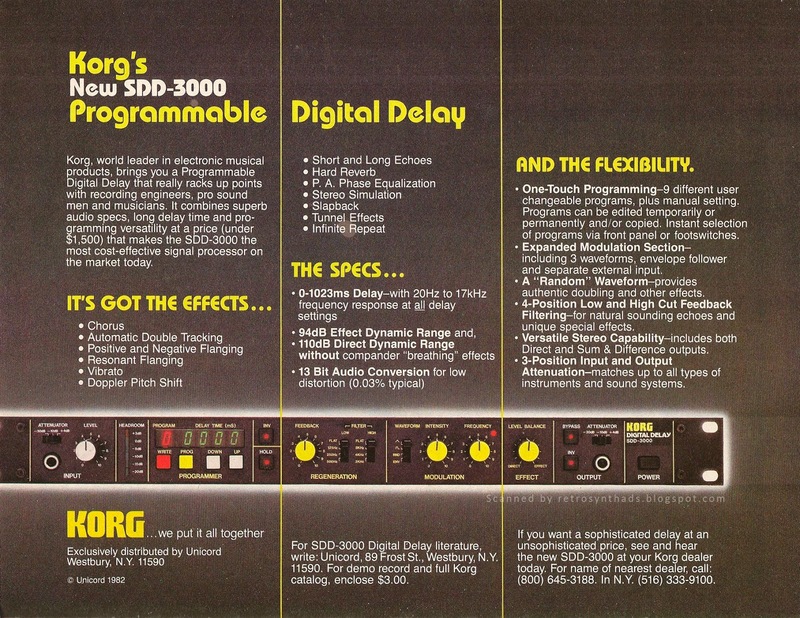 Roland SDE-3000 and SDE-1000 digital delay "Instant Delay" full page colour advertisement from page 7 in the May 1984 issue of Keyboard Magazine. Okay - I realize effects, and especially vintage effects, and ESPECIALLY vintage digital effects are NOT my core competence. I've got a rack of them like most vintage synth addicts I know (they're cheap! ), but I don't know them as deeply as, say, my Pro-One or Minimoog. I keep telling myself that when it comes to the blog I should stick to what I know - vintage synth ads and brochures. But, just like with the performance review I'm prep'd for recently, everyone should have "stretch" objectives. Those outside the comfort zone. So, consider effects like one of my blog's stretch objective. There is no denying the influence effects such as delay, chorus, reverb and distortion have had on synthesizer players since they first started appearing on stage or in recordings. And today, some synth manufacturers like Dave Smith Instruments treat some of those effects as just another sound-block. Like a filter or LFO. I'm looking at you, Evolver! But back in the day, effects hardware was hard to come by. Well, cheaply anyways. So, it makes sense that companies like Roland, Korg and others, would advertise directly to keyboard players in magazines like Keyboard when the price point of effects hit that magic sweet spot. Ever since Korg announced the recreation of their SDD-3000 effects unit in to a pedal format, I've been hoping it would lead other manufacturers to realize the big love out there for vintage digital effects among those still using analog mixers like myself. And that's lead me to do a bit of research to see what other big guns were part of the delay world back in the 80s. Korg wasn't the only synthesizer manufacturer to toy with digital effects advertising in Keyboard Magazine back then. A few others got into the act soon after, including Roland with this advertisement for their SDE-3000 and baby brother SDE-1000. 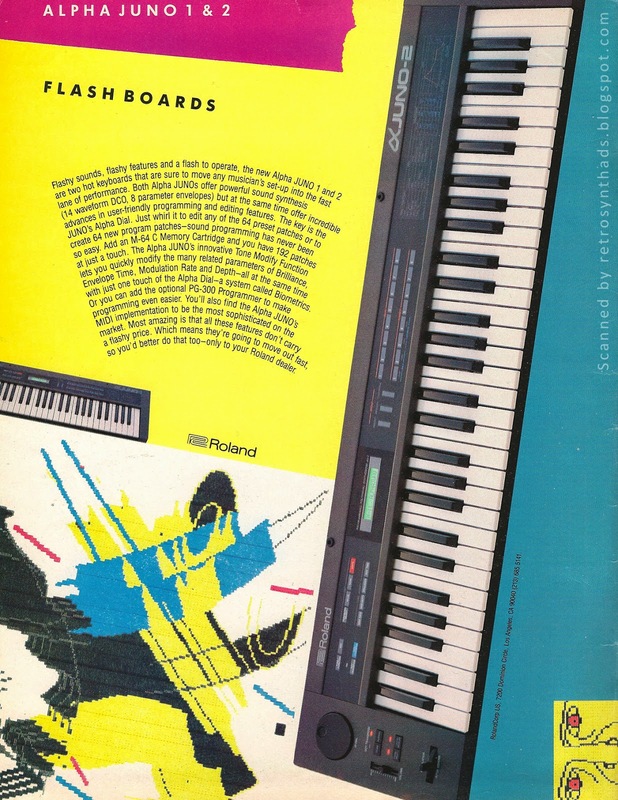 Turning attention to the ad itself, if you recall it was in the mid-80s that many companies like Roland were toying with computer art in their advertisements. I blogged about it while referring to Roland's 1986 Alpha-Juno ad just a few weeks ago that featured more solid abstract artwork. It's wire-frame origins can really be seen when jumping back in time two years to this SDE ad and its more Tron-influenced artwork with glowing wire frames, digital string art and lazers. Yum. It makes me happy. Like Roland TB-303 level of happy. Computer effects can only go so far towards the overall design. Ad-copy and layout goes a long way too - especially when readability is involved. Like when listing out the specs of a synthesizer or effects unit in an ad. But in both of these ads, Roland makes the ad-copy part of the design at the expense of readability. This isn't necessarily a bad thing - and the creative half of me prefers it, but it does make it tougher for the reader. Looking at that SDE ad, as cool as those lasers are, the one beam is cutting right through the middle of the text. The result is four hanging hyphens and no paragraph breaks. The Alpha-Juno ad uses a similar technique - one block of text, only this time using a smaller font and even curving it. Readability suffers a bit, but for me it's all about the art! And I'm digging it. No matter, if you take the time to read through the SDE ad, the marketing team has done a good job of making the case to purchase these Roland effects units over some of the more complicated effects units out there (like the Korg, maybe?). Their argument is that more features equals more time to set up effects. If you don't have the patience to read it, that's okay. Readers of Keyboard were actually introduced to many of those features when these two SDEs showed up three months earlier in the February 1984 Spec Sheet section of Keyboard. "Roland Programmable DDLs. The SDE-1000 and SDE-3000 are programmable digital delays. The SDE-3000 can produce delays out to 4.5 seconds. Delay times are set in 0.1 and 1.0 ms increments. The unit has eight memory positions, which are user-programmable, and can be accessed via a footswitch. LED readouts display all vital system functions. The SDE-1000 offers delay times of up to 1.25 second and four memory positions. Both units are equipped with four remote switch jacks for ease of operation onstage. These are : delay on/off, hold (for repeating delay endlessly with adjustable tempo). Playmate (to set delay times remotely during performance), and preset (for switching between memory channels). The SDE-1000 is also equippted with a modulation foot control jack for footpedal control of modulation rates. Both units are also rack-mountable. Prices are: SDE-3000, $1,095.00; SDE-1000, $499.00. Roland-Corp, 7200 Dominion Circle, Los Angeles, CA 90040."